I received Zhoozsh! as a birthday present from TheHusband and have been meaning to make something from it ever since (4 months and counting...). The recipes are mostly simple and straight forward, usually with a back story and of course, something to zhoozh it up a bit. The focus however remains on easy to cook, low maintenance, "kuier" type meals. According to Urban Dictionary, zhoozsh/zhoosh means to fix something, to tidy something up, but what I understand it to mean, is adding that little bit extra. An unexpected twist you could say. 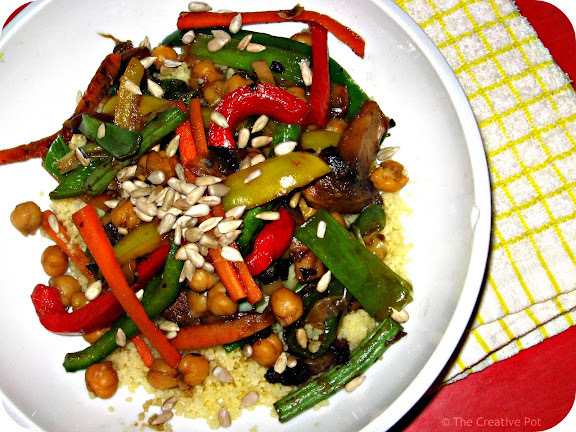 And in the spirit of that, I've added some chickpeas and a handful of sunflower seeds to this veggie stirfry. Zhoozsh it up, I say! 1. Add 1 1/3 cup boiling water to the couscous and allow to stand for 7 minutes. Fluff up with a fork, drizzle a teaspoon olive oil over and season with salt. Set aside. 2. Meanwhile, heat 2 teaspoons canola oil over high heat in a large wok, then add carrots and stirfry for a minute or two. Add bellpeppers and beans, fry for another 3 - 4 minutes. Add mushrooms, and after another 2 minutes, add the spring onions. Fry briefly, until veggies have just started to soften, but still retain quite a lot of crispness. Remove and set aside. 3. Heat the remainining oil in the wok, then add the ginger, garlic and chilli and fry for a minute to release the flavours. Add lemongrass, lemon juice, honey and soy sauce, then add the veggies and chickpeas. Cook until heated through, then serve on a bed of couscous, and top with sunflower seeds. I keep on missing Meatfree Mondays.....this is an excellent meatfree alternative!!! I'm pretty sporadic myself Nina! Its great that you are still maintaining meatfree Mondays, I am struggling sometimes with Vegan Tuesdays, but I am trying. I really like this, especially the addition of the chickpeas. Thanks for introducing me to this book, which I will certainly check out. Zhoozsh - I love that word, we use it for all kinds of things like "You look Zhoozshed up - got an interview?"! This stirfry is very Zhoozsh, and I love it! This is a dish crammed with vitamins and just because something is healthy doesn't mean it can't taste gorgeous too. Totally my type of lunch!